Founded back in 1898 by the famous Swiss watch brand Auguste Raymond released a novelty Jazz Age Moonphase Chronograph, which will be officially presented at the annual exhibition of watches and jewelry BaselWorld 2013. The watch has a polished round case with brushed the side, 38 mm diameter stainless steel. Water Resistant – 30 meters. Silver dial, the center of which is a guilloche, equipped with black Roman numerals, the center hands, of which the hour and minute covered with fluorescent material is white. Another central arrow with arcuate indicator is provided for indicating dates, figures are given on the periphery of the dial. Rectangular aperture with thumb index at 11 and 13 hours are intended to indicate the day and month. 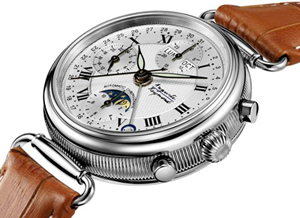 Time display in 24-hour format is due to the additional dial with two hands at the 9 mark. Index phases of the moon is in the “6:00”. New features also chronograph function, which through counters at 12 and 6 marks. Closes dial sapphire set also on the case back. The model is equipped with a Swiss automatic ETA caliber Valjoux 7751, 25 stones, with a frequency of 28,800 vibrations per hour and 40-hour power reserve. Mechanism further trimmed and decorated in the style of Cotes de Geneva, equipped with blued screws and gold-plated rotor. Come watch on brown leather strap with stainless steel buckle.